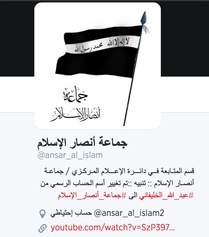 Ansar al Islam’s Twitter feed. While the Islamic State of Iraq and the Sham (ISIS) is the most prominent insurgency group in the offensive against the Iraqi government, it is by no means the only organization participating in the assault. 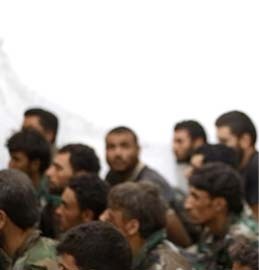 Baathists and other organizations, including jihadist groups, are involved in the fighting as well. Among them is Ansar al Islam (AAI), which was founded in September 2001. AAI has claimed at least 14 operations on its Twitter feed since the beginning of the rebel offensive earlier this month. The tweets were posted on June 12. Five of the claimed attacks took place in the province of Kirkuk, and another five on the road between Kirkuk and Tikrit, a city northwest of Baghdad. Another two operations were purportedly executed inside Tikrit. And the remaining two assaults were carried out in Mosul and on the road between Mosul and Baghdad. Nearly all of the attacks targeted the Iraqi military and police. AAI claims to have killed a number of soldiers, officers, and policemen; and also captured weapons, ordinance, and vehicles. 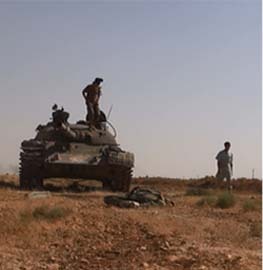 In addition, one of the operations targeted an oil field. AAI garnered international attention after the 9/11 attacks, when al Qaeda members and other jihadists fled from Afghanistan to the Kurdish areas of Iraq where AAI has long been based. The most notorious of these jihadists was Abu Musab al Zarqawi, who supported AAI. A video distributed online by AAI in June 2013 named Zarqawi, who was killed in 2006, as one of its earliest allies. However, Zarqawi’s own group blossomed, becoming al Qaeda in Iraq and eventually the Islamic State of Iraq. Despite these historic ties, there is no solid, publicly-available evidence that AAI is under the command of al Qaeda’s senior leadership today. In recent months, prominent jihadists have used social media to spread the rumor that AAI has become an official branch of al Qaeda. The move allegedly came in response to the feud between al Qaeda and the ISIS’ senior leadership. While it is certainly possible that such a deal was brokered behind closed doors, neither AAI, nor al Qaeda, has officially confirmed it. A review of AAI’s statements from late 2012 until recent months shows that the organization has repeatedly attempted to quell its fight with the ISIS. The group even appealed to Ayman al Zawahiri, who did not answer AAI’s request for help. It is not clear why Zawahiri declined to support the group. Zawahiri has answered appeals from other jihadists embroiled in a fight with the ISIS, including the Al Nusrah Front. Below is a partial timeline of AAI’s statements since October 2012. 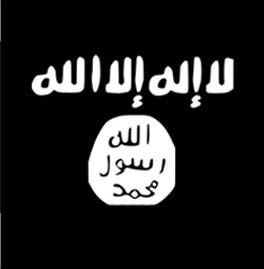 The statements reveal that AAI has continued to operate in Iraq despite its rivalry the ISIS. The messages and videos described below were released via AAI’s Twitter feed, or on its al Thabaat online forum. Many of the statements were first obtained and translated by the SITE Intelligence Group. Oct. 16, 2012 – In a letter addressed to the “leadership of the Islamic State of Iraq,” AAI says that it has been forced to change its longstanding policy of support and neutrality for al Qaeda’s branch in Iraq because of the ISI’s repeated attacks. “As we have decided and announced, and since the beginning and to this day, the positions of our leadership toward Al Qaeda, Al Tawhid al Jihad [the precursor to al Qaeda in Iraq and the ISI], and the Islamic State of Iraq are clear and defined either by support or positive neutrality, without intervening in any political or military plans of Al Qaeda or its affiliated groups in Iraq or other places and without contradicting or instigating against them,” the statement reads. “We are changing our position only to comply with sharia and we were forced to do this by a major toll we paid for the sake of God. Any other way would benefit only the enemies and exclude jihad and Islam from any positive outcome.” AAI goes on to warn that it “is very important to cooperate together to limit the irresponsible behavior of some members, which could lead to chaos that harms jihad.” The group’s warning prefigures events that will unfold in Iraq and Syria in the coming months. 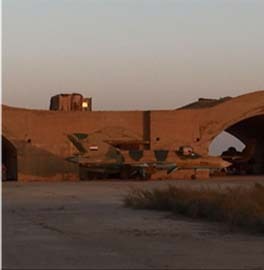 Nov. 25, 2012 – AAI launches a suicide bombing targeting a Shiite militia camp in the Iraqi town of Rabia, which sits on the border with Syria. The group claims that the militia members were about to be deployed to Syria to fight on behalf of Bashar al Assad and against Sunni forces. Interestingly, in a statement released on Dec. 1, 2012, AAI says that the ISI cooperated in the operation. “After the camp was demolished almost completely, a detachment from the heroic brothers of the Islamic State of Iraq mobilized so as to destroy those who remained, and the brothers all returned him safely,” SITE’s translation of the statement reads. 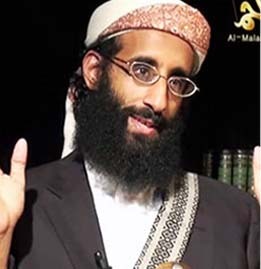 Feb. 17, 2013 – AAI sends a letter to Ayman al Zawahiri asking for his assistance in its ongoing dispute with the ISI. The authors of the letter, who call themselves the “command” of AAI, are highly respectful of Zawahiri, saying they “express their utmost respect and appreciation” for the al Qaeda emir. However, there is no indication in the letter that AAI is following orders from al Qaeda’s senior leadership. AAI repeatedly refers to the ISI as “your branch,” meaning AAI believes the ISI answers to Zawahiri. AAI also says Zawahiri is “the primary reference for the Islamic State of Iraq, and the only party responsible for them that is recognized by them.” The group later mentions the letter in a public statement dated Sept. 18, 2013. The group says that when it sent this letter to Zawahiri in February 2013, the al Qaeda emir was “responsible for the Islamic State at the time.” Months after AAI’s February 2013 letter, the ISIS leadership openly disobeys orders from Zawahiri. June 3, 2013 – AAI announces that it has an official Twitter account. The announcement is distributed online by the al Fajr Media Center, which disseminates al Qaeda’s propaganda. In the days leading up to the announcement, AAI posts messages highlighting the activities of its fighters in Kirkuk and Mosul. June 4, 2013 – AAI releases a statement denying media reports that it had declared war on the ISI. The statement is attributed to the group’s media department in the Mosul district. AAI denounces the ISI for spilling the blood of their fellow jihadists, but praises members of the group who have abstained from the infighting. “You have knowledge that the Islamic State of Iraq often loses control over the escalation valves as a result of the various decision-making sources,” AAI writes. Sept. 18, 2013 – AAI announces that the ISI has forced the group to retaliate, yet it remains open to reconciliation. “We, the Command of Ansar al Islam … announce officially that the Islamic State of Iraq has forced us to respond to their aggression and injustice and to reward them in kind,” the group says in a statement translated by SITE. 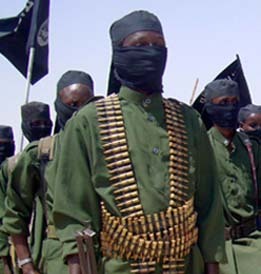 “We did not wish for matters to come to this, for the history of Ansar al Islam and its relationship with the banners testifies to its dealing with the banners of jihad with support originally, and positive neutrality out of necessity.” The group says that it attempted to resolve the dispute with the ISI through “initiatives and constant messages for reform and halting of the fitna [discord], but it did not receive any response.” One of these “initiatives” was the group’s letter to Zawahiri in February 2013, which did not elicit a response from the al Qaeda leader. Oct. 12, 2013 – AAI recounts the history of its failed negotiations with the ISIS and says that its rival has not lived up to the terms of a proposed ceasefire. In a message released on its Twitter feed and its online forum, AAI claims that members of the ISIS have repeatedly targeted AAI jhadists in the city of Mosul. AAI’s list of attacks indicates that the group maintains a significant presence in the city, which was seized by rebels in June 2014. Oct. 14 – 15, 2013 – The group addresses its Eid al Adha greetings to Indians, Kurds, and Syrians, showing that it is attempting to appeal to an audience far outside of Iraq. In its message to Syrians, AAI endorses a bizarre conspiracy theory in which the US is pursuing an alleged plan devised by the historian Bernard Lewis. This “plan” supposedly hinges on “creating an American-Israeli-Iranian balance of interests that protects a gradual and quiet Iranian expansion in the region,” according to a translation by the SITE Intelligence Group. Nov. 6, 2013 – AAI pledges to fight the “Sons of Iraq” after press reports indicate that Iraqi prime minister Nouri al Maliki will seek to revive the anti-al Qaeda group. AAI says the “Sons of Iraq” are apostates and it is “necessary to fight them.” The “Sons of Iraq” were part of the Awakening movement that, along with American and coalition forces, previously turned back al Qaeda in Iraq’s advances. In reality, Maliki refused to fully integrate the “Sons of Iraq” into Iraqi security forces and the coalition dwindled in size and capacity, with some members even joining the ISIS and other anti-government groups. Dec. 11, 2013 – The group posts pictures from its Sheikh Rashid Ghazi Camp, which is named after a deceased extremist cleric in Pakistan. Ghazi was killed in July 2007 when Pakistani forces laid siege to the Red Mosque in Islamabad. The mosque harbored al Qaeda and other jihadist groups. AAI had previously “addressed a message” to Ghazi’s brother, “expressing its wish to correspond with him about religious issues and advice,” according to the SITE Intelligence Group. AAI posts additional pictures from the camp in the weeks that follow. March 3, 2014 – AAI posts a video of the Sheikh Rashid Ghazi Camp. The video features a clip of Osama bin Laden from a 2007 speech entitled, “Come to Jihad.” In the speech, bin Laden praises Sheikh Ghazi, saying that he and his students sought to implement sharia law in Pakistan. Oren Adaki, an Arabic language specialist and research associate at the Foundation for Defense of Democracies, contributed to this article.